The past month has been good to me, as far as project progress. The “Neighbourhood” quilt is really close, I just need binding (maybe a Friday Finish??). This will be my ALOYF for October as a carry over of September. I was so close. This week I have also made a huge amount of progress on my Sew Mama Sew project….its coming up next week. Here’s how my list is looking, going into October. Sorry, for the bad photo below. 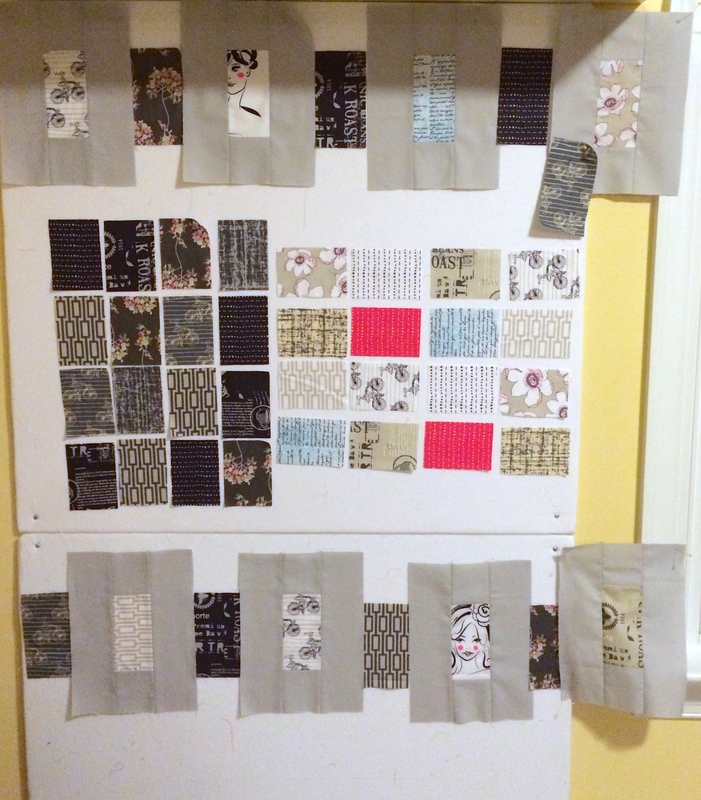 The Cherie quilt is now up on my design wall, I actually started sewing and laying it out this week. Better photos to come. Linking up to Lee over at Freshly Pieced for WiP Wednesday. 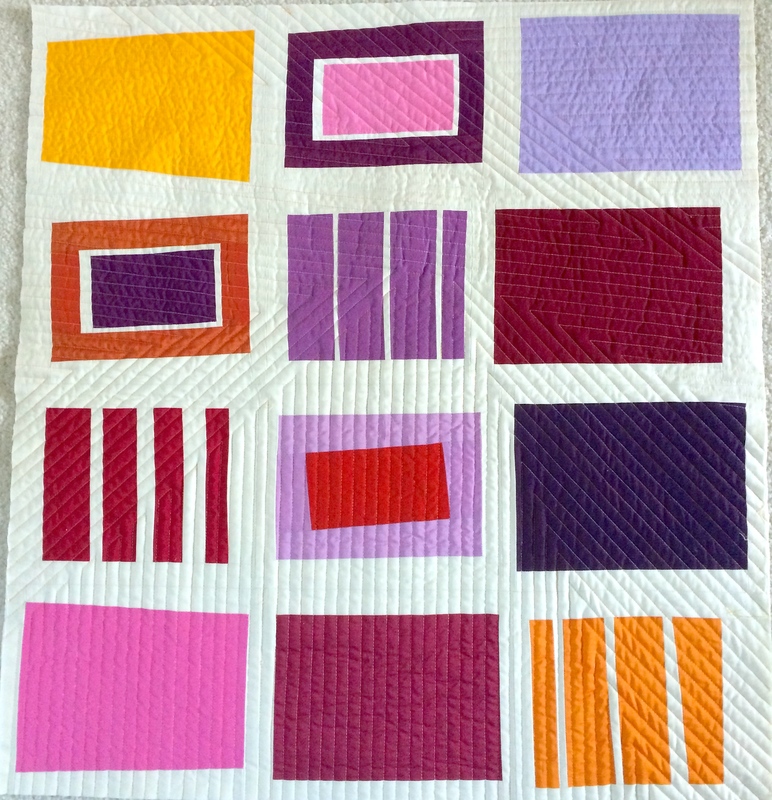 This entry was posted in Uncategorized and tagged Cherie Quilt, Neighbourhood Quilt on October 2, 2014 by mlwilkie. Wow, I just love the quilting on the Neighborhood Quilt. Love those angles. Very dramatic and simple. I’ll be interested to see what you choose for the binding on that Neighbourhood quilt – I think I’d probably wind up going with the yellow or orange that are in the corners, but I tend to prefer contrasting and even loud bindings, even when I know something quieter or more blend-in-able would work better. I think with this quilt you could really go either way – just depends what sort of overall theme you’re hoping it’ll lean toward. Great colors on your Neighborhood quilt. Sometimes, there’s nothing else than plain fabrics!! Yay for finishing the quilting! I stall on making the binding, even though it’s a fast and simple process. The quilting on the neighborhood quilt looks great – the angles from the quilting keep my eyes really roving over the pattern.